Apple CEO Tim Cook’s annual Charitybuzz auction has raised a record amount, topping the number from 2016. 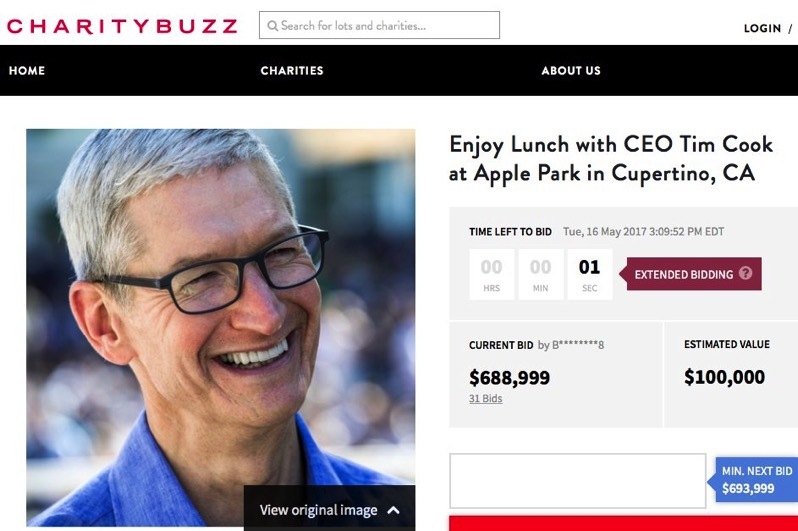 The lunch with Tim Cook ended at $688,999 USD, according to a final screenshot taken by @setteBIT (via MacRumors), topping last year’s total of $515,000 USD and the 2013 amount of $560,000 USD. The auction kicked off at the beginning of this month, offering the winner and a guest to have a one hour sit down lunch with Cook (on Apple’s dime of course) at the company’s new Apple Park campus. The winner of the auction, despite paying nearly $689,000 USD, will still have to pay for their own airfare and accommodation to reach Cupertino, California.